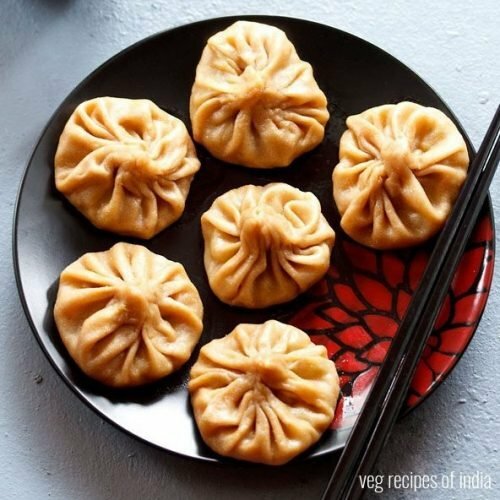 a healthy version of veg momos made with whole wheat flour or atta. take the 1 cup whole wheat flour and ¼ teaspoon salt in a mixing bowl. add water in parts. i added overall ¼ cup water + 3 tablespoons water. mix and then knead to a soft dough. finely chop or grate all the vegetables. you will need 1/3 cup finely chopped carrot, 1/3 cup finely chopped cabbage, 1/3 cup finely chopped capsicum and ¼ cup finely chopped onions or spring onions. take the veggies in a mixing bowl. add 1 teaspoon finely chopped ginger. next add the following spices - 1/8 tsp turmeric powder, ¼ tsp red chilli powder, ½ tsp coriander powder, ½ tsp cumin powder and ¼ to ½ tsp black pepper powder. season with salt. mix everything very well. keep aside. grease the steamer pan very well with oil and keep aside. divide the dough in small or medium sized balls. sprinkle some flour on a dough ball. roll each dough ball into a thin circle of about 4 to 5 inches in diameter. try to get the edges to be thin and the center to be thick. apply water with your finger tip or with a small pastry brush towards the circumference edge. place 2 to 3 tablespoons of vegetable stuffing in the center. lift one side of the edge and start to pleat. start folding and forming the pleats one by one. towards the end, join the pleats in the center. heat 2 to 2.5 cups water in a steamer or in an electric cooker or in a pressure cooker. let the water come to a boil. place the pan with momos in the steamer. * check notes on how to steam the momos in idli pan or pressure cooker. steam momos for 10 to 12 minutes. don't overdo the steaming, as the dough becomes dense and dry. the steaming time may vary upon the thickness of momos' cover and the size of momos. if you make small momos, then 6 to 7 minutes is fine for steaming. when you touch the momo then dough should not feel sticky to you. this means they are done and the momos will have a glossy look. time of cooking momos varies from intensity of the flame and kind of pan and the steamer you are using. once done, then serve whole wheat veg momos with a spicy sauce like schezwan sauce or tomato-chili sauce or chili sauce. you can also serve it with red chilli garlic chutney. momos go very well with a spicy sauce. to steam the momos in a pressure cooker - heat about 2 cups water in the pressure cooker. place the momos in a pan inside the cooker. remove the vent weight/whistle and steam the momos for 10 to 12 mins. if not done, then steam for a few more minutes. the water should not come in contact with the momos. to steam the momos in an idli pan - proceed same way, you make the idlis. heat water in the pan. grease the idli moulds with oil. place the momos on the idli moulds. place the moulds in the pan and steam the momos.